Imagine you have a friend small enough to fit in your purse or briefcase who will give you nightly massages, easing stress, fatigue, and muscle tension all for a onetime cost of about $3. Think yellow. Think tennis balls. The procedure is simple: place a tennis ball on a part of the body that is sore or tight and rest your weight on it. The pressure softens tight muscles and increases circulation. Dancers have long used tennis ball self-massage to work out their kinked-up muscles, and body workers frequently prescribe the practice for clients healing from chronic injuries. Asana practitioners searching for ways to increase flexibility and comfort in their bodies are beginning to get on the ball, too. Unlock the gluteals, lengthen the hamstrings and adductors, and restore balance to the muscles along the spine. Self-massage with tennis balls is greatly enhanced by stretching, which further increases circulation and reeducates the muscles to rest at a longer length. Combining asana with self-massage is particularly useful for those of us who have muscles that for various reasons—injury, overuse, or years of inactivity—resist stretching. Here are some tips for using tennis ball therapy to unlock the gluteals, lengthen the hamstrings and adductors, and restore balance to the muscles along the spine. We’ll start with a simple technique so you can get a feel for how this works before going on to more complex applications. Lie in savasana and place the tennis ball in the center of the fleshiest part of the left buttock. The pressure may be painful, but if it feels like good pain and you can relax in it, stay there for a few breaths. (If you find you are contracting muscles in defense against the pain, move the tennis ball around to find a spot that is less painful, or practice on a padded surface, which will reduce the pressure.) Relax and breathe. Imagine the breath circulating around the pressure and visualize the muscle softening over the ball. After a minute or so, remove the ball. Before repeating the process on the right side, notice how the left buttock feels flatter than the right and softens more easily into the floor. What happened? You used the tennis ball to force blood, lymph, and toxins out of the muscle tissues. When you removed the ball, fresh blood flowed in, supplying the tissues with oxygen and nutrients. The next step is stretching the muscle to increase blood flow and reset the muscle tone. Muscles with high tone are tense and tension impedes blood flow. Stretching allows the muscle to be softer, more fluid, and longer in its resting state. Placing the tennis ball in the buttocks unblocked the flow of circulation in the gluteals and external rotators. Now we can give these same muscles a good stretch with the reclining leg cradle. Lie on your back with your feet flat on the floor and your knees pointing toward the ceiling. Cross the right ankle over the left knee and clasp your hands behind the left thigh. (If you struggle to connect your hands, extend your reach with a strap, so that your shoulder blades are on the floor and the pectoral muscles are open.) Bring the thigh toward you, stopping just at the place where you start to feel the stretch. Reach the left sit bone down along the mat so the sacrum stays grounded and hold for several relaxed breaths. As the stretching edge softens, follow it by bringing your thigh closer. Now angle your left thigh an inch or two to the outside of your left shoulder. Reach to the opposite diagonal with the right sit bone. You’ll feel an increased stretch in the right hip. Repeat on the other side. Tennis ball self-massage can be applied to any part of the body you can reach. The hamstrings are a good place to start, because many of us experience restriction there. Activities such as running, dancing, or sports that favor the development of one side of the body tend to injure the hamstrings or work them unevenly, which may cause knee problems as well as postural imbalances. There are three different hamstrings on each leg, and any or all may be tight. You can do some preliminary stretching to determine which hamstrings are restricting your movement. Tennis ball self-massage can be applied to any part of the body you can reach. Lie on your back with both feet flat on the floor and the knees pointing toward the ceiling. Reach up with the right leg and catch the arch of the foot with a strap. Straighten the leg until you reach the painless side of your stretching edge. If your leg is in line with the right shoulder, you are stretching the central hamstring. If you ease the leg toward the left shoulder, you will be stretching the outermost hamstring. If you direct the leg beyond the right shoulder, you will be stretching the innermost hamstring. If you are like most people, there will be one angle that will be harder to stretch than the others. Track the degree of stretch you have in each of the three positions. Then repeat these stretches with the left leg. At some points, the pressure may be painful. When this happens, ease up on the pressure so that you are not tensing against it. To work out any troublesome points in your hamstrings, begin by sitting in a padded chair. Place the tennis ball near the sit bone. Direct the ball to the hamstring where you are experiencing the most tightness or pain. Rest your weight on the tennis ball, shifting gently to increase or decrease the pressure. At some points, the pressure may be painful. When this happens, ease up on the pressure so that you are not tensing against it. Relax and breathe as before, noticing if the level of pain decreases. Gradually increase the pressure, but stay within your comfort zone. Sometimes these tender points cluster. You may find that if you move the tennis ball a quarter of an inch in any direction, you will find another painful spot. Move to the next spot when the pain decreases by half. Follow the pain with the tennis ball, working slowly and patiently. Sometimes the pressure on a certain point will trigger pain, numbness, or sensations like heat or tingling in other areas of the body. These “trigger” points indicate a greater degree of trauma in the tissue. Lighten up on the pressure, but stay on this point until it stops triggering. You will want to work with these points regularly, gradually restoring healthy muscle tone. If you don’t have any particular soreness in the hamstring but you want more stretch, simply move the tennis ball down the leg inch by inch, holding for 15 to 30 seconds in each place. Stop just above the knee. Repeat on the other side and be aware of any difference in sensation. To finish the massage, come again into the strap stretch. Chart the difference in the two stretches, before and after. Stay and breathe in a comfortable stretch long enough to feel the muscles soften and elongate. Sometimes forward-bending poses are hampered by tight adductors. Sit on a padded chair or on a hard chair with a folded blanket draped over the edges. To release the right adductor, place the tennis ball in the left hand, and place the back of the left hand on the right-side edge of the chair. Lean your body to the left and drape the right inner thigh over the tennis ball. Lean your body back toward the right to apply pressure. Begin at the groin and work your way down inch by inch, staying longer at points that are particularly painful. Again stop just above the knee. You can clear both sides, or if there is one side that is tighter, focus on that side. The goal is that both sides come into balance. Use baddha konasana (butterfly pose) to stretch the adductors. Begin sitting with the soles of the feet together. If your back rounds in this position, sit up on one or more folded blankets. Interlace your fingers around your feet, sinking the sit bones into the blanket as you lift your back. Feel the ribs stretch away from the hips. If you want more of a stretch, pivot the whole torso forward from the hip joints, keeping the back straight. Reach the sternum up and forward as you reach the sit bones down and away. Find a degree of stretch that is comfortable, so you can hold it without strain. Stay for several minutes and breathe, focusing the breath up the back of the spine on the inhale, and down the front of the spine on the exhale. Soften the hip crease and the groin. As your muscles release, follow the stretch by increasing the forward bend. To come out of the pose, reach out with the crown of the head even more as you bring your torso back to center. Straighten your legs and let the feet move like windshield wipers from side to side to release the stretch. We’ve explored some ways to balance the lower body. Let’s see how tennis ball pressure, followed by twists and lateral bends, can rebalance spinal muscles. If the muscles of the pelvis and legs have patterns of uneven tension, chances are they will be reflected as imbalances in the spinal muscles. If you’ve ever sat for a period of time on an uneven surface, you may have noticed that your back or neck felt strained. That same imbalance can be created by uneven patterns of muscle tension. Let’s see how tennis ball pressure, followed by twists and lateral bends, can rebalance spinal muscles. Begin by placing two tennis balls in a sock and closing the open end with a rubber band. 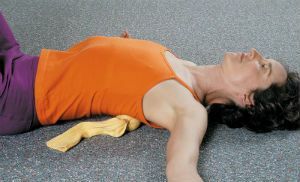 Lie on your back on a padded surface with your feet flat on the floor and place the sock so that the balls are on either side of the base of the spine. Stay there and breathe. Inch the balls up the spine, holding and breathing at the painful spots. When you get to the lower ribs, it may become too painful to continue. You can try moving to a bed, which eases the pressure considerably. You can also substitute racquet balls, which are softer and smaller. Or you can skip the lower part of the ribs, and begin to work between the shoulder blades. Work patiently and breathe, feeling the muscles soften over the balls. When you get near the top of the shoulders, switch back to a single tennis ball. Place the ball on the top of the left shoulder, near the joint. Tuck the tail under and lift the hips as if you are coming into bridge pose, which will place pressure on the tennis ball. Ease the right amount of body weight onto the ball by raising or lowering the hips. Stay and breathe, taking the time to feel the muscle tissue softening with each breath. When you are ready, settle the hips back on the floor, and inch the ball toward the neck. Push back up into bridge pose to apply pressure. Repeat on the other side. Release the pose and rest. To work up the neck, remain on your back with your feet near the sit bones, and rotate the head to the left. Place the ball at the base of the left side of the neck, making sure the ball pressures the flesh and not the spine. Slowly come into bridge pose, gauging how much pressure is right for you. Breathe and soften, again releasing the pose to inch the ball up the neck. Then clear the right side. The muscles we just massaged, loosely called the paraspinals, are a multilayered, complex web of support for the spine. When these muscles are tight, not only do they cause pain and stiffness, but they can interfere with the functioning of the nerves, which in turn affects organ functions. We can give the nerves the room they need with twisting and bending asanas, which stretch these muscles. Sit up on a cushion or a folded blanket if your hamstrings don’t allow your spine to straighten. We’ll start with marichyasana (sage twist). Sit in dandasana (staff pose), and bring the left foot close to the groin, knee pointing to the ceiling. Press the sit bones down into the floor and lift the crown of the head up to straighten the spine. Sit up on a cushion or a folded blanket if your hamstrings don’t allow your spine to straighten. Wrap the right arm loosely around the left knee, and place the left hand on the floor behind you. Begin to twist to the left from the level of the kidneys by dropping your awareness to the individual vertebrae. Feel each vertebra twisting in relation to the one below it. Twist bone by bone all the way up to the top of the neck. Breathe deeply into the twist, which stretches the ribs and spine from the inside. Stay for several breaths, and then repeat on the other side. Next, come into parighasana (gate pose), which stretches both the deep and superficial muscles of lateral bending. Kneel on a padded surface with hips extended. Reach the left leg out to the side, keeping the right leg perpendicular to the floor and the hips even. Turn the left foot out to a comfortable diagonal. Inhale the arms out to the sides and bend to the left, placing the left hand on the thigh and stretching the right hand palm down over the left leg. Reach out over the leg with the crown of the head, breathe fully into the right side of the spine, and focus the breath on areas that are tight. Be sure not to collapse the rib cage down, but instead reach over the leg with the crown of the head to increase the space between each vertebra. Stay several breaths, and then change sides and repeat. These are just a few of the endless possibilities for using tennis balls to enhance your asana practice. As you reestablish the muscles’ ability to lengthen, you will bring new life, strength, and energy to your limbs and spine. As blood circulation increases in previously blocked areas, other areas will rebalance as well. Most importantly, the more flow you can experience in your inner body, the more comfortably and gracefully you will move through life.